Sports Costs > How Much Do Paragliding Lessons Cost? How Much Do Paragliding Lessons Cost? Paragliding, known as the simplest form of human flight, is a type of recreational and competitive flying sport where the pilot sits on a harness suspended below a parachute or a fabric wing. It’s non-motorized and requires the flyer to launch by their feet. Those who want to become a certified paraglider will have to attend a training program that helps them prepare to perform the activity properly. In order to paraglide on your own, lessons and classes will need to be taken in order to become certified as a pilot. Most lessons are going to range anywhere from $200 for a simple two-day introductory course to as much as $2,300 for the complete P-2 training/certification course. Once a P-2 certification is acquired, a pilot can fly without instructor supervision. A P3 course, which is an optional course paragliders take after the P-2, can cost about $2,000 to $2,500. Most instructors will highly recommend taking a two-day introductory course to give you a taste of this activity. If you like what you see, then you will be able to fly on your own, with the help from an instructor on the ground, using a radio, in as little as two days. For example, ParaGliding.us provides different types of paragliding lessons. They offer a 2-day introductory course, as well as P2 certification course, which is needed to become a certified pilot. These courses, depending on the classes you sign up for, can cost $350 to $1,650. The basics of paragliding will be learned through the first lessons. This will include the basics of launching, turning and landing. Known to be easy to learn, students are often able to perform these activities on their own within the first few days while an instructor communicates with them from the ground. A beginner area is often used and is referred to as a training hill. After the basics, which are often taught during the two-day intro period, the student will be able to progress to the Para 2 certification course, which will teach the student about meteorology and different flying techniques and safety procedures. The training time will all depend on how often the student attends the courses and how they absorb the material. A student who shows up every day and understands the concepts can graduate in little as two weeks, while a student who only attends classes on weekends and has a harder time understanding can take up to three months to complete. During the first two days, students will be able to fly solo with instructor supervision; however, in order to acquire all of the skills needed to fly, the Para 2 certification course, which takes up to seven days and about 25 high flights, will be required to be able to paraglide on your own. The USHGA has a mandated amount of ground school time, flights and flying days before you can be certified. Paragliding p3 requirements, which is an additional certification a student can obtain after he or she obtains their P2, require the student has a P2 certification, 20 hours of solo air time, 20 flying days and a minimum of 90 flights. New paragliding gear, according to Paracrane.com, can cost $5,000 for new gear or about $3,000 for used gear that is still in flyable condition. A new paraglider harness, for example, can cost about $3,000 to $4,000, while a two-way radio and variometer, which tells you how fast you’re going, can cost an additional $500. Do keep in mind that if you do fly a lot, you will have to replace your paraglider harness every five years due to the harmful UV light from the sun. Common paraglide equipment purchased includes paragliders, paragliding harnesses, reserve parachutes, variometers, helmets and accessories such as a backpack, paraglider bag and/or UV protector to protect the paraglider when not in use. Training outside of the classroom may be necessary in order to log miles in the air. Some classrooms may include this time, while others will charge extra for the equipment rental and time. When looking for a school, make sure that the instructor is certified by the United States Hang Gliding Association. Make sure that you check the ratings of this particular professor with the organization. The highest rating, according to parasoftparagliding.com, is Advanced Tandem Instructor. For more information, you can call 719-632-8300. Be sure to inquire and ask about the student to teacher ratio. It’s best to get into a class that will be able to give you a lot of one-on-one attention. Most classes shouldn’t have more than four people. See what the lessons are going to entail. Most lesson planners are going to have a full outline of what the student is going to learn. Check the safety rating of the school and know how many students they have taught in the past. Under Federal Aviation Regulations Section 103, paragliders are regulated; however, they don’t need a license to operate, seeing it’s a self-regulated sport. Because of this, the United States Hang Gliding Association makes sure pilots and instructors adhere to the guidelines of the USHCA. The longest hang gliding flight on record is 474.7 miles. The first key difference is the shape. A hang glider will consist of a sailcloth stretched over a metal frame, while a paraglider simply has a harness suspended underneath a fabric wing. A paraglider is known to manager easier than a hang glider since paraglider pilots will change their direction and pitch by gently pulling on the paragliding cords that connect to the canopy. With hang gliding, the pilot will have their body strapped to the glider and will have to manage their direction by using their body weight. Hang gliders can reach higher speeds when compared to a paraglider, creating a different experience when comparing the two. A hang glider can reach speeds up to 100 miles per hour, while a hang glider can cap out at about 35 miles per hour. A hang glider is known to be more durable since it’s made from a thicker dacron material, resulting in less fading; it can last up to 10 years if taken care of properly. 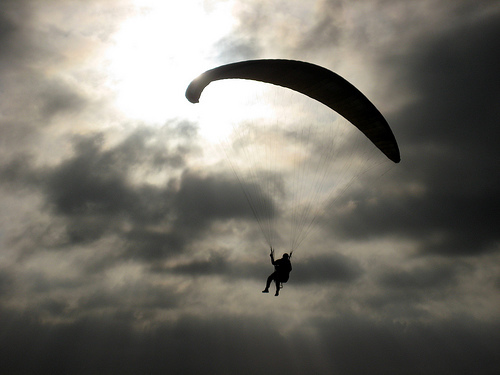 A paraglider, on the other hand, is made from a nylon which can suffer from UV damage faster than that of a hang glider, lasting about five years on average. As for landing zones, paragliders can land relatively easy since they will come in at slow speeds and won’t need a lot of space to land. While landing a hang glider can be easy, they will still need more space due to the advanced wings. If you are serious about paragliding, consider taking an introductory course to get a feel for what paragliding is all about. If you don’t like it, you will only be out a few hundred dollars rather than a few thousand. Some schools will offer a discount if you purchase the equipment through them. Schools may offer a discount if more than one student signs up for the class.